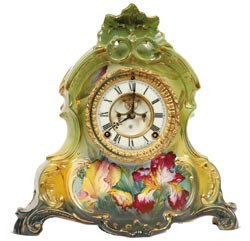 Ansonia Clock Co., Royal Bonn, "LaNormandie", ca 1904. Shadesof green and yellow are the predominant colors. A shell like open designat the top. Large yellow and red flowers, some green rushes and leaves andthe usual gold accent. The case is 13.5" high, 13" wide. One of the moreattractive designed cases. Ly-Ansonia, page 611.